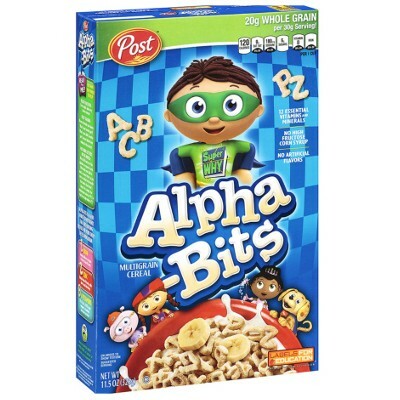 Alpha Bits Cereal from Post is a wholesome and tasty American treat. Enjoy it for breakfast or even as a snack. It is delicious from A to Z! Not only is Alpha Bits fun to eat, it is a tasty way to practice the alphabet. Your kiddos can identify letters or spell silly words (if they don't gobble it all up first). Each box contains 12 oz. of cereal. Whole grain oat flour, sugar, yellow corn flour, salt, hydrogenated coconut and palm kernel oil, emulsifier E1001, color E160b, antioxidant E321 to preserve freshness, antioxidants E301-E300 (vitamin C), reduced iron, zinc oxide, vitamins B3-B6-A-B2-B1-B9-B12-D. Manufactured in a facility that also processes wheat. Contains GMO. Nutrition facts (for 100g): calories 407Kcal, total fat 5.6g (saturated fat 0g), total carbohydrate 77.8g (sugar 22.2g), protein 11.1g, salt 1.3g.